Single-gear juicers, masticating juicers, slow juicers, cold press juicers—they are known by various names. Understand how these juicers work, the pros and cons, and compare some popular models. How Do Single-Gear Juicers Work? A single-gear juicer is also known as a gear juicer, or a masticating juicer. To masticate means to chew or to grind to a pulp. A single-gear juicer has a ‘worm-like‘ gear that drives the produce and squeezes them through a stainless steel screen. This action tears open the produce’s cell membranes and releases its deep-seated nutrients and enzymes. It also breaks up more of the phytochemical from the produce, resulting in a richer colored juice which is also richer in its nutrients and minerals. Unlike the centrifugal juicer that operates at about 3,000 ~ 16,000 RPM, a masticating juicer operates at a much lower speed at only about 80 ~ 120 RPM, which does not disrupt the cellular structure of the fruits and vegetables. This greatly eliminates oxidation to the juices, therefore, preserving the precious enzymes and nutrients that are closest to its natural form. If you have tried the juices extracted from both a centrifugal and a masticating juicer, you will notice a marked difference in the quality of the juices between the two. For example, an apple juiced on a centrifugal juicer will produce an oxidized brown-colored clear juice (only water content with no enzymes and nutrients) which has a metallic taste; whereas the apple juiced on a masticating juicer will result in un-oxidized, even-colored and great tasting juice. Oxidized juice is effectively, spoiled juice. Read how a gear juicer can help minimize chemicals and pesticides contamination in your juice. It has a healthy, even color, showing that it’s full of enzymes and nutrients. It has 20% more juice yield. It has less foam (reduced oxidation). It has oxidized and turned clear brown and has separated. There is only water content with oxidized enzymes and nutrients. It has 20% less juice yield. It has a lot of foam that will speed up oxidation. 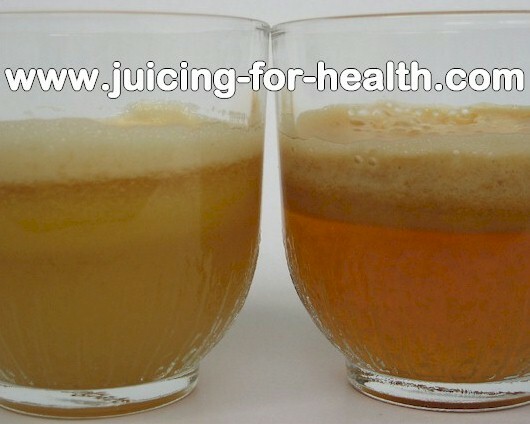 See comparison of juices extracted using a masticating and centrifugal juicer. The very first and original single-gear juicer was built using the HORIZONTAL design. Over the years, the design has been reproduced in different improved models and distributed all over the world. In different parts of the world, they are named differently. Some of the popular ones in the USA are like the Samson GB9000 series and the Omega J8000 series. In Australia it’s the Oscar VitalMax and in Asia it’s the Alpha Juicer. These juicers are also multi-purpose food processors that are able to mince, grind, chop, make soy milk, shave ice, and make pasta. With this horizontal design, the feeding chute diameter size is at 1.25 inch, unlike the large/wide mouth you find on centrifugal juicers. It is something to get used to but really its purpose is so that produce are not fed too quickly as this juicer operates on very low RPM. This is necessary to preserve the enzymes and nutrients. In most recent years, there is a revolutionary new patented VERTICAL design gear juicer that seems to be setting the trend for more aesthetically pleasing juicers for the modern kitchen. Some of the popular designs are the Hurom Slow Juicer, Omega VRT 330/350HD and the Kuvings Wide Mouth Slow Juicer. 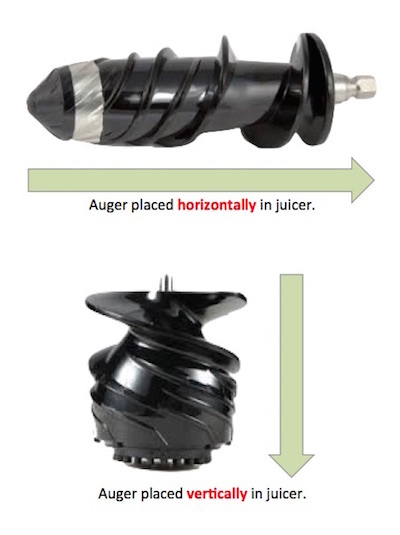 By changing the juicing process from horizontal to vertical, the vertical juicers save kitchen counter-top space and allow the use of a larger and more efficient auger. The feeding chute size is wider at 2.25″ x 1.25″, reducing on preparation time on cutting up the produce. Due to its vertical design, produce fed into the chute goes in by gravity and is pulled in by the larger auger, making the self-feeding juicing almost effortless. Unlike its horizontal cousins, these vertical gear juicers are built mainly for juice extraction purpose only, and it does its job very well. A masticating juicer is effective for juicing leafy vegetables, wheatgrass and herbs. The juice yield is higher than that of a centrifugal juicer as the pulp expelled is much dryer. Every drop of juice should go into your glass, not into the pulp bin. You get a higher value for your produce and it’s more economical in the long run. Read my shortlist of recommended slow juicers. If you already have a gear juicer, see: How to care for, and optimizing your gear juicer. 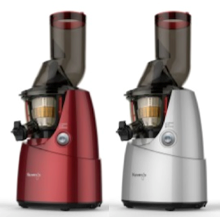 A single-gear juicer operates much more quietly compared to a centrifugal juicer. The low-speed rotation eliminates oxidation, therefore, preserving the enzymes. The method of extraction tears open the produce’s cell membranes and releases its deep-seated nutrients and phytochemicals. Extracted juice is stable and can be stored in the fridge for up to 24 hours. The juices produced has very little foam. You get high quality juices that taste rich and concentrated. Very good for juicing soft and leafy vegetables including wheatgrass or alfalfa sprouts, so no need to purchase another wheatgrass juicer. Dryer pulp, resulting in higher juice yield compared to a centrifugal juicer. Very easy handling and takes just under two minutes to wash up. Makes juicing fun. A single-gear juicer may be a bit pricey for beginners, with prices starting from just a little over $200. Is very heavy (approximately 4.5~10 kg) but this could also be an advantage as it is stable when in operation. If portability is important for you, choose models that have a carry handle. For Southeast Asia delivery, check out the Alpha DA-900 or the Kuvings Wide Mouth Slow Juicer that we are selling on this site. I personally own four masticating juicers that have given me so much joy with my juicing experience. Come to my kitchen and see what I have. Take it from one who juices every day. I bought my first unit about eight years ago and have never looked back. There are many single gear masticating juicer models in the market. Don’t know which one to choose? See my list of recommended single gear juicers here.